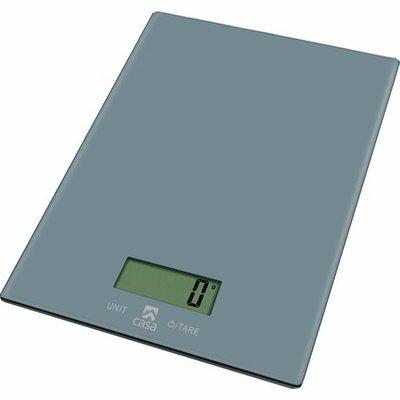 The Casa glass kitchen scale is perfect for any kitchen, with its sleek 4 mm thin glass, making it ultra hygienic and easy to clean. It comes complete with 'touch to set tare' (used for setting the empty container weight to zero, so the scale only shows the weight of the material being weighed). There is also an overload indicator and a low battery indicator as well. You will never have to worry about this scale sliding off the table with it's non-slip, rubber feet.